Winners of two Grammy Awards, Pearl Jam is set to rock the Rocky Mountains this summer at The RIDE Festival. The 5th annual RIDE festival, held in Telluride Town Park, Colorado, brings an impressive lineup of rock and roll music and other festivities. 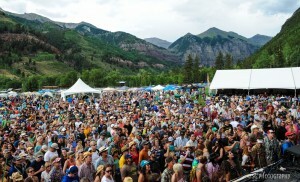 The three-day festival floods Telluride Valley on the second weekend of July with Pearl Jam performing on Saturday, July 9th. Tucked in the heart of the San Juan Mountains, Telluride is a historical region of Colorado once home to the Native American Tribe, Ute. After discovering gold in Colorado in 1858, it didn’t take long before the mountains were flooding with mining excavations searching for gold, silver, iron, copper, lead and zinc. The festival capital of the Rocky Mountains wasn’t always known by its current name. The mining camp of Telluride was first established under the name, “Columbia,” in 1800. Some believe Telluride’s name is derived from the gold-digging farewell-saying, “to-hell-you-ride!” As another story goes, the name originated from tellurium — a non-metallic mineral — which was never actually found in Telluride Valley. 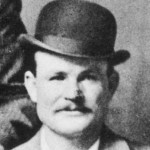 Before attracting festival-goers, the town appealed to gold-robbers and gold-diggers alike; in June 1889, Butch Cassidy robbed the San Miguel Valley Bank in Telluride making off with $24,580 — worth about $700,000 in today’s economy. The population fell from 5,000 residents in 1890 to a mere 600 by the 1960s. The mountain receives over 300 inches of snow each year — making it one of the best snow resorts in the state. 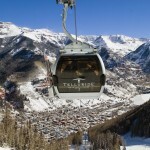 Today, the Telluride Ski Resort spans over 2,000 acres of terrain for skiers and snowboarders. 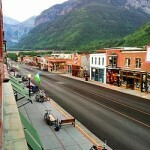 Known for its many festivals, Telluride completely transforms in the summer. The RIDE Festival is just one of many epic events the town hosts each year. The town’s many shops, restaurants and bars attract many visitors to explore the historic town. The town sits in the center of a box canyon — surrounded by mountains and cliffs — in a densely forested region of the Rockies. Telluride delivers a breathtaking landscape for some of the state’s best festivals and this summer Pearl Jam will be jamming out for their first time in the mountain town. 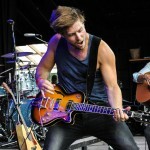 Some of the nation’s top musical talent attend The RIDE Festival each summer. Since its start in 2012, The RIDE Festival has hosted a variety of musical talent, with headliners such as Edward Sharpe and The Magnetic Zeros, The Lumineers, Widespread Panic and Thievery Corporation. Benefits from the festival each year goes to the town’s KOTOfm — one of the nation’s last remaining commercial-free radio stations — available to listen to online at KOTO.org. The town of Telluride features its own group-seating Gondola which transports you between Telluride and the Mountain Village. You can also catch a ride on the Galloping Goose Bus or the Dial-A-Ride — all of which will be offering special extended hours during The RIDE Festival. We definitely recommend car-pooling to town with a group of friends to share this incredible weekend rock-experience! The legendary band isn’t the only big name attending The RIDE Festival. Cage the Elephant will be headlining on Sunday, July 10th — the day after Pearl Jam’s performance. 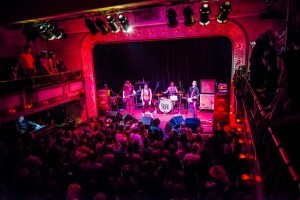 The current lineup features over a dozen bands, with more to be announced, including Cage The Elephant, The Temperance Movement, Jerry Joseph & The Jackmormons, The Sheepdogs, Radio Moscow, HoneyHoney, Big Something, Little Hurricane, The Band of Heathens, Tyler Bryant & The Shakedown, Mike Farris & The Roseland Rhythm Revue. The RIDE Festival 2016 takes place on July 8th, 9th and 10th 2016 at Telluride Town Park. Tickets go on sale March 4th at 11:00am Mountain Standard Time. Festival ticket holders receive free access to the NightRIDE shows each evening featuring intimate performances in the town’s local venues. What better excuse to head to the mountains with your friends than for a weekend-rage-er with Pearl Jam and a dozen other bands? You can reserve a campground near the festival and enjoy the various activities the region has to offer, such as hiking, rafting, biking and the hot springs. So what are you waiting for? Grab some friends and head up to Telluride this summer for one hell of a rock festival. Buy your tickets when they go on sale Friday, March 4th, so you don’t miss out on The RIDE Festival 2016!